This is a card the suggests that getting what you want doesn’t always make you happy or meet your needs, sometimes you are left to carry the ball while others enjoy the benefits of your labours. 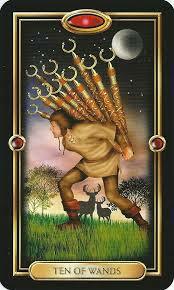 It is a good time to look seriously at the situation, are you unhappy with the commitments you have made? Do you need others to help carry the load? Have you over committed financially or emotionally? Feeling under pressure for too long often leaves a person running for safety, engaging in behaviours that break down the very manifestation they tried so hard to create. If finances are a burden one may simply stop paying and let the bank take responsibility for winding up the deal or not make the car payment and let the dealer repossess. This card can herald an opportunity to divest yourself of complicated manifestations as this ten is a call to action, now is the time to take charge of your life to ensure that you can continue living in a joyful manner. In relationships refusing to communicate will force your partner to take charge at some point so that they can create a better relationship for themselves, and while it will relieve the pressure it could also cost you something special. Sometimes it is appropriate to walk away but as there is always a consequence for doing so, it needs to be considered carefully lest instead of pressure, you find yourself deeply mired in regrets. Identify what the pressure really is and communicate that to those who can aid you whether that is your job, your lender, friends or your partner.